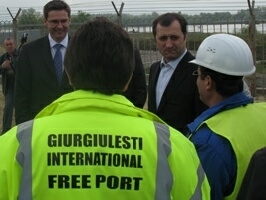 On 16th of April the prime-minister of Moldova, Vlad Filat, visited the Giurgiulesti International Free Port. Also he visited the state-owned Giurgiulesti Passenger Port. During the official visit, an excursion around port’s facilities was organized by the port administration. The prime-minister had the possibility to learn more about the operation of the oil terminal, grain terminal and the future plans on the construction of the general cargo terminal. Mr. Filat discussed with the administration and employees of the port about the present situation and new opportunities that these two terminals are creating. “For me was important to see on the spot what are the problems faced in the activity of the oil terminal, grain terminal and the passenger port and what are the expectations”, — declared Filat. The prime minister also emphasized that the port offers significant benefits to Moldova and encouraged construction of additional facilities in order to diversify and improve the range of services provided to passengers and cargo transporters. Thomas Moser, representing the general investor in GIFP, stated: “Following the successful completion of the oil terminal in 2007 and the completion of the grain terminal in 2009, we have started the works for the construction of the general cargo terminal earlier this year. Major works will start in May when heavy machinery will arrive from Germany for the construction of the berth. We plan to completethe general cargo terminal by the end of this year. Following the completion of the general cargo terminal, we can start the transshipment of goods transported in containers, big bags, pallets or in bulk».